The Plains Indians were nomadic, so most of their structures that they could easily travel with or re-make easily. They used Earth Lodges, Tee Pees, and Wigwams. One of their most used structures were Tee Pees. They were the main structures for the teepees. They were tent like structures made of poles covered with hides of animals. They used 13 to 20 poles; 3 to 4 main poles were leaning inward tied together at the top. The teepee was covered with about 14 to 20 buffalo hides. The hides were sewn together with sinew, not thread. The circular base’s diameter was about 15 feet. There were also adjustable smoke flaps at the top of the tee pee so they could make a fire inside. In the wintertime, they added grass at the bottom for insulation. This is what the teepees were for. Another main structure are the wigwams. They were used to store teepees (which are foldable) to keep them from rotting. Another thing that wigwams stored were the Plains Indian’s food. These are 2 of the main structures of the Plains Indian’s. The Plains Indians typically lived in one of the most well known shelters, the tepee (also tipi or teepee). The tepee had many purposes, one of which was mobility and agility as the Plains Indians needed to move quickly when the herds of bison were on the move. Tepees were quickly put up and taken down so the Indians were never far behind the herd. An entire Plains Indian village could have their tepees packed up and ready in an hour. There were few trees on the Great Plains so the Plain tribes valued the long poles that tepees required and carried the poles with them. order to fit the horses. logs and were covered with brush and dirt. In Plains culture, tribal women made, owned, and erected the tepees. 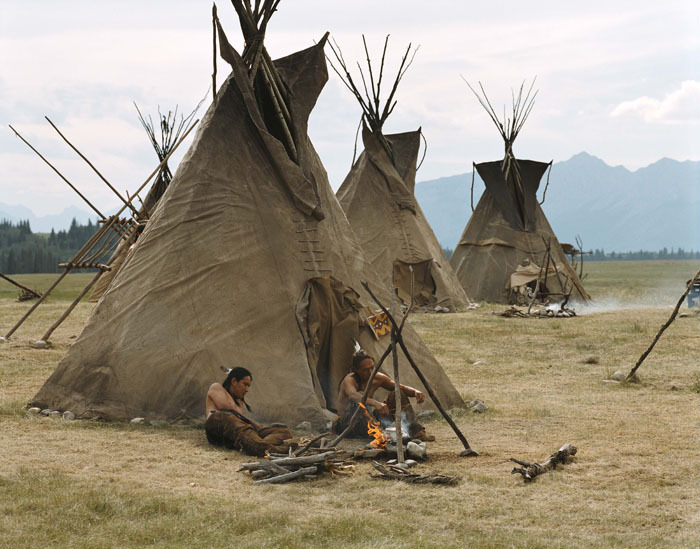 Since tepees belonged to the women, men had to ask their wife’s permission before decorating the exterior of their homes. It took two Indian women to put up a tepee. The men Indians never help put up the tepees. They were the hunters and warriors. Six people would usually sleep in one tepee. One side was for the men and the other side was for the women. All weapons were stored on the men’s side and the cooking pots were stored on the women’s side. The tepee served the same purposes as today’s houses. It provided shelter, warmth, protection, and a kitchen of sorts as the fire in the center was main form of food preparation. 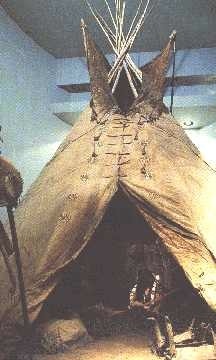 The tepee had a fire resistant lining from the buffalo skins and smoke flaps that allowed smoke to escape. In addition, the tepee had an opening at the top that allowed for ventilation. The tepee was an ideal home because it held up to the hot weather in the summer and the cool weather in the winter. The tepee was also very durable to the extreme winds which blew across the Plains from the west. Native Americans used their structures such as tipis (also spelled teepees or tepee) for many purposes. One of these reasons was the fact that tipi can be set up and put down very rapidly which enabled the tribes to move quickly. Another activity that Native Americans did with tipis is cooking. Inside a teepee a Native American family might worship and praise their gods. The reason that tipis were invented was to follow the buffalo, since the Native American tribes depended on the buffalo for their survival. Its amazing that even these people can build such simple but amazing structures. Another type of structure that Native Americans used is called an earth lodge. An earth lodge was used in the winter, to stay warm, when Native Americans didn’t travel. An earth lodge could also be used as a defensive bunker in a war against another tribe. Also earth lodges blocked drafts much better than a teepee. The “door” of the earth lodge was much more protective than the open hole of a teepee. This door was used to keep unwanted things out and keep the things inside safe and warm. This shows how diverse Native American structures can be. A wigwam is a type of portable housing, like a tipi, but more settled. A wigwam is a more settled version of a tipi. Wigwams where used to travel, but there where used with tribes that didn’t travel very often. Usually an extended family lived in a wigwam so it would hold roughly six to seven people. Inside a wigwam women would cook, weave, and clean clothes and/or other objects. Native Americans have a type of structure for each situation, even though they live a primitive life style. The Design of the Tipi from the outside to the inside. The Tipi is a cone shape because that makes it very hard for the tipi to blow over in the wind because there are no place to catch the wind or water so it cannot hold any water. But it can’t be a prefect cone because the poles would have to stick out and it would never be able to be closed fully so when it would rain or snow it would come inside. The Native Americans solved this by tilting the cone but tilting the cone made it shorter. The tipi was made out of two half circles that were sewn together they came together and looked like two ear flaps coming out but you could open and close the flaps to prevent wind, precipitation, and sun light. On the hides would have been native painting or pictographs that showed how the owner went on the warpath. Inside there would be a fire pit. They dew cloths on the side to keep the heat in and the dampness out. There would have also been a Container called parfleche, which were mad of raw hides and were painted with geometric Designs that were used as drawers or suitcases. The Design of the Tipi help to protect the Plains Indians against any kinds of weather. “Earth Lodges.” AAANativeArts.Com. 16 Oct. 2007 <http://www.aaanativearts.com/‌article1161.html>. Isaacs, Sally Senzall. Picture The Past: Life in a Sioux Village. Chicago,Illinois: Heinemann Library, 2002. “Native American Houses In Older Times.” Mr.Donn.org. 16 Oct. 2007 <http://nativeamericans.mrdonn.org/‌homes.html#wigwams>. Native Celebs. 16 Oct. 2007 <http://www.nativecelebs.com/gallery/albums/intothewest/teepee.jpg>. Paige, Joeseph. "Indian Teepee." Native American Articles. 2006. Native Languages of the Americas. Plains Indians. 10 Oct. 2007 <http://library.thinkquest.org/J0110072/reports4/plains.htm>. “Plain Indians.” American Indian History Online. 2006. 16 Oct. 2007 <http://www.fofweb.com/‌NuHistory/‌default.asp?ItemID=WE43&NewItemID=True>. Powers, William K. Indians of the Northern Plains. New York: G. P. Putmnam's sons, 1969. “The Interior of Earth Lodges.” The Mandan. 16 Oct. 2007 <http://www.komondor.de/‌Neue_Dateien/‌Interior%20of%20Earth%20Lodge.htm>. Yue, David, and Charlotte Yue. The Tipi. New York: Alfred A. Knopf, 1984.